HISTORY: Not much in Formula One, but they've a fine pedigree in racing over in the good ol' U S of A, particularly the Newman-Haas Indycar team, which European racing fans may remember as the team that powered Nigel Mansell to victory in that championship in 1993. So they entered in 2015 with what was, in essence, a customer Ferrari, having licensed as many parts as humanly possible from the grand Scuderia, not to mention giving their Italian benefactors a leg up on wind tunnel time that semi-legally accelerated their development. They were midfield from the word go, leapfrogging the ailing McLarens, plus Manor and Sauber, and benefitted from hungry drivers whose careers depended on good results. Haas are in a key, if shaky, position at present. F1 will do a lot more in America - that is the hope of the new owners, and there's no reason to think they wouldn't make it happen - so an American team is a massive asset to the sport at present. The worry is that without success and sponsorship now, they won't be around to enjoy the inevitable. 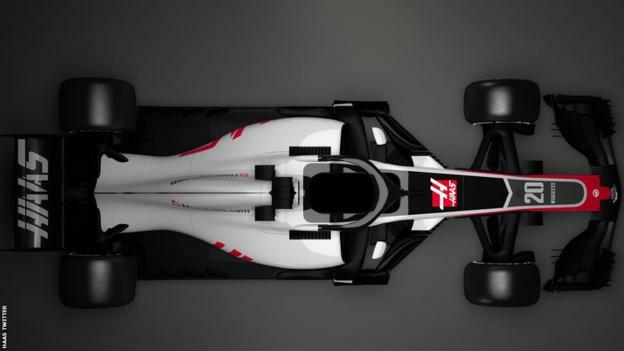 From Haas' Twitter, accessed through BBC Sport. When they entered, a lot of observers were predicting a stars and stripes-adorned monstrosity. The people behind the car are too canny to let that approach fly in a traditionally European race series, as that would likely make them the least popular team with established fans. Instead we get this, which is a little lacking in character but pretty sleek. Look at all that lack of sponsorship, though - send a chill through the bones in these expensive times. Only more racing in America, or a team-up with an engine or tech partner, can remedy that one. Grosjean is a great example of a perfectly good racing driver who took a long time to settle into a good rhythm. Shame he had to nearly decapitate Fernando Alonso and Kamui Kobayashi at Spa to get there. Since his suspension for that incident he's had a spell as de facto team leader for Renault, which cemented his maturation, before moving to Haas in an attempt to get into Ferrari when his old teammate Kimi Raikkonen retires. Unfortunately Kimi hasn't moved on yet, and one has to think next season might be the likeable Frenchman's last chance. Kevin Magnusson is one of McLaren's young rejects, unfairly (if predictably) scapegoated for the poor performance of a poor car and tossed aside when Alonso's contract came up. Engine Blood, being as old as the hills, remembers seeing his father Jan win the F3 championship at Silverstone, pipping Dario Franchitti to the title. The son seems to be just as good, with a more settled temperament. He's earned his place in F1 and long may he remain. LAST YEAR: 8th in Constructors' Championship, 47 points. 8. Romain GROSJEAN (FRA) - 13th, 28 points, best finish: 6th. Not bad for a team in their second year, but also not very eye-catching in terms of progress. The Ferrari engine was much closer to Mercedes last season but the progress in car development didn't seem to match, and as such they were consigned to nearly the back, though they were in the fight for sixth for basically the entire season. PROSPECTS: Well, testing put them fourth on merit according to the analysts, but McLaren's assumed ascension could knock the whole midfield down one place. Throw in the lack of a title sponsor and some ominous noise about complaints from other teams over the whole Ferrari-ish-ness of their setup, and we have to have our fingers firmly crossed that these worthy competitors can survive a couple of years until F1's next American adventure.